Hi from Bangkok again, another Chromacoma monthly musing for you, I have been meaning to share this with readers of this site for ages and yet it always slips away from me somehow. One of the things that I really would struggle to live without in the digital age would be the wonderful world of podcasts. Like talk radio only you get to choose the exact show, content, theme and time and place that you listen to it. The only thing that I don't quite get is why they aren't bigger than they are. Sure they are HUGE to those who swear by them but in the grand scheme of all things digital, it's amazing how many people don't partake. To people who are into them, it's a no brainer but I also regularly talk to lots of people who seem to be fully ensconced in a digital life with all of its trappings but who either say things like 'What are podcasts?' or 'Oh, I couldn't get on with them' and I find it genuinely surprising at times. Oh well, to each their own. They are perfect for filling in the tiny (or maybe larger) blank gaps in your day and also can help turn a negative down time into a productive or entertaining part of the day. For me they absolutely rock when stuck in traffic or on my lunch hour (dropping off to sleep to one also deserves honourable mention). Seeing as photography is probably the world's most popular hobby, it soon comes as no surprise that the myriad options for podcasts on the topic can be a bit overwhelming. I have been through several of them over the last nine or ten years but none have quite stayed the distance for me. 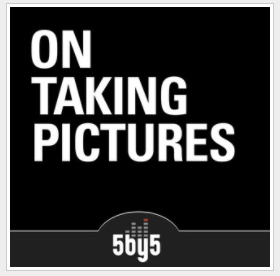 That changed about three or four years ago when I started listening to 'On Taking Pictures', a weekly podcast in a semi-radio show kind of format and style. It's a quality production both in terms of technical know how and sound quality plus really solid, deep content and thorough, thought provoking conversations on photography. What I personally don't need in a photography podcast is new releases and gear reviews etc, I am pretty happy with most of my gear choices and often opt for classical/vintage equipment and film anyway so the latest/greatest new DSLR or lens doesn't really bother me that much. This show is not about that, preferring instead to be addressing the more artistic, scientific and often downright philosophical aspects of photography that lend themselves well to this kind of media. That's not to say that discussions about new cameras and lenses don't creep in from time to time but only typically when relevant to the greater discussion in hand. There are often geeky detours into conversations about computers and the like but I don't mind that too much myself, it even helps me keep abreast of things at times that I otherwise might have overlooked. I know it seems strange using an exclusively aural media format when dealing with an equally exclusive visual subject but if you just give this a go, I think you might really get into it. This is an American show and is hosted by the same two guys every week, Bill and Jeffrey. That might sound very boring but actually it really isn't, they have a pretty strict format and they are also generally pretty organised about topics and they let this be the backbone around which their long form discussions build. There are lots of cool things woven into the show's fabric such as a dedicated listener's shared photo board with weekly challenges or assignments for those who like such an idea as well as cool stuff like a 'Photographer of the Week' section every week, highlighting not only the old masters of the art but also some really cool upcoming trailblazers who might well have been off the radar otherwise, this is a personal fave aspect of the show for me. There's also a good accompanying website and the like so you can go and check out any pictures that really piqued your interest during the show. The show is 99% free of profanity and whilst I couldn't care too much about that myself, it's worth pointing it out as it means that it's generally just about safe to listen to at home or in the car with kids around, assuming you don't always want to use headphones and would like to listen to it as one would listen to the radio from time to time. Bill is a successful, professional editorial photographer specialising in excellent and often highly original portraiture. He's based in NYC with a great background which also includes some serious musical education. Jeffery is a man who wears many hats but has extensive experience in many artistic pursuits and is a photographer, painter, author (about photography) and has put together several really solid artistic websites with high quality content both in the past and the present. He's a California-native who relocated to a new life on the East Coast in more recent times. Point being (and although they might not agree) it's actually not just a couple of nobody wannabes talking about that which they do not know, quite the opposite and yet they are very humble, down to earth and self-deprecating whilst also being honest and open about their lives instead of presenting us with fake personas that would no doubt wear thin before long. That's one of many reasons why I keep listening and why I would like to recommend you to do the same. I have no affiliation and have never met either of them. I once had contact with Bill by email and he was a really nice bloke, I fully expect that Jeffery would be too, again it's the relatable nature of them that makes it such an evergreen podcast. Bravo!